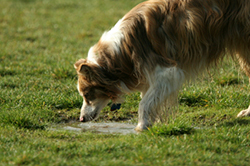 A dog becomes infected with Giardia when it swallows the cyst stage of the parasite. In susceptible dogs, once the cyst passes into the dog's intestines; it goes through transformation to the trophozoiteor feeding form and attaches to the intestinal wall to feed. If sufficient numbers are present, clinical signs of damage to the intestinal wall will develop. Trophozoites reproduce by dividing, and some transform into the cystic form. Eventually, the dog passes cysts in its stool.